It is believed that the celebration of this auspicious day which falls on the 5th day of the Magh month (Gregorian calendar month of February) marks the beginning of spring season. Punjab region celebrates this festival by flying kites.The mustard plants begins to flower during this time, creating stretches of fields into bright yellow carpets.The blooming mustard plants symbolise youth, freshness, procreation,love, change and life itself. Its a day when people wear yellow clothes and celebrate with sweets that are yellow in colour. In Uttarkashi, its a farmers festival. Doors of homes are decorated with yellow flowers to welcome spring and the sowing season. In Bihar people wears yellow clothes and yellow tilaks of turmeric on their foreheads and perform prayers early in the morning to the Sun, Ganga and the Earth. At this juncture I must share with you a poem which has been written by Shri Narendra Modi about Basant. Its penned in Gujarati but I hear that his book on poems and translations have been published. Click on the link to listen to artist Parthiv Gohil sing this composition. At sweet sixteen, melody of a cuckoo within On whom showers romance, the flowers of spring? Who’s getting wedded in woods? Each tree is lit in festive moods! It is believed that this festival originated during the Aryan civilization. Aryans crossed the Saraswati River and settled along the banks of the river.Hence, Saraswati River began to be associated with fertility and knowledge and locals began to celebrate this festival. According to legend there was a very proud princess who refused to marry any suitor who could not match her knowledge. The pundits made Kalidasa, who was dumb, participate in a question answer session with the princess. Since he could not talk, he answered what he believed by using sign language which the pundits interpreted as they liked. The princess married him and found out that he was dumb and not intelligent.She kicked him out of the palace. Dejected he was about to commit suicide when Goddess Saraswati appeared before him and asked him to dip in the Saraswati river. When he emerged from the river he was a changed man and began to recite verses. Many educational institutions worship Goddess Saraswati on this auspicious day. They drape her in a yellow sari and offer her yellow sweets.New schools are opened on this day. A child learns to read and write his/her first word on this day.It is said that Goddess Saraswati invented Sanskrit, the mother of all languages.She is the Goddess of knowledge, wisdom, music and learning. Thus the encouragement by the Indian Government to worship Saraswati in all Educational Institutes on Vasant Panchami. To celebrate this festive day #FoodieMonday #Bloghop group decided that we would make something special to celebrate #VasantPanchami which is our 77th theme. I decided to make saffron sooji phirni with fresh mango jelly. For whatever reason or belief we celebrate Vasant Panchami, I know that if it were not for the opportunity given by my parents to attend school, if it were not for the wonderful teachers that helped me to read and write and above all the blessings of Ma Saraswati, I would not be writing this post or for that matter any other posts on my blog. Heat 2 tbsp of milk till its hot. Add the saffron strands and let it infuse. Take a saucepan and sprinkle agar agar over 1¼ cup water and let it rest for 15 -20 minutes. Put the soaked agar agar mixture over medium and bring it to a boil. Lower the heat and stirring frequently, let it simmer till all the agar agar is dissolved. Add sugar and let it dissolve in the hot mixture. Add salt and the mango pulp. Mix it well. Pour the mango mixture into serving bowls or glasses, filling them half way. Let it cool a bit and then put it in the fridge. Add the sooji and stir it constantly till it becomes light brown in colour. Add the milk, sugar and cream. Increase the heat to medium. Keep on stirring the mixture till it becomes thick. Add cardamom powder and the soaked saffron along with the milk. Mix well and let it cool a bit in the pan. Spoon the phirni over the cold and set mango jelly. Put the bowls or glasses in the fridge so that the phirni sets. Just before serving, garnish with pistachios. Add sugar to the jelly mixture according to the sweetness of the mango pulp. I added less sugar to the sooji phirni. If you like your dessert sweet then add more sugar. You can make phirni with flavours of your choice. Make sure you stir the phirni constantly after adding the milk as you don’t want the sooji to settle at the bottom of the pan and burn. Phirni looks super tempting. Lovely presentation and excellent write up. An interesting phirni with mango jelly. Beautiful write-up. 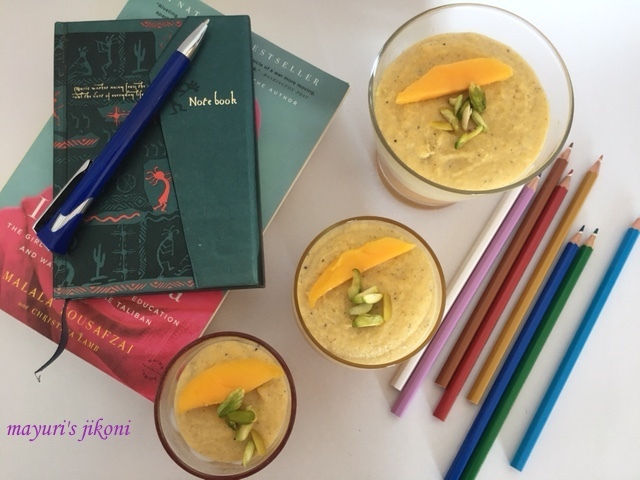 Wonderful write up dee and what an innovative way to layer the sooji phirni with mango jelly. Thank you Preethi, it certainly was a learning experience for me too as we don't celebrate Vasant Panchami with so much festivity and food here. Thank you Alka, it's a great booster coming from an expert photographer like you. Thank you so much Sujata, I had to research and write so that even I get to know why we observe Vasant Panchami. Thanks Saswati, wanted to use the mango in the recipe so decided to make the jelly. Oh what a wonderful sweet dish with mango. I love phirni so mango flavour sounds perfect. Happy vasant panchmi to you. Lovely to read Mr Modi's poem to. Looks so yummy…Nice combo of phirni and jelly. Thank you so much Kriti. Thanks Shobha. With sooji it cooks really quickly unlike the rice one. Thanks Mina, I too loved the poem when I came across it. Listen to the Parthiv Gohil sing the composition, its really beautiful. Thank you so much Ruxana.